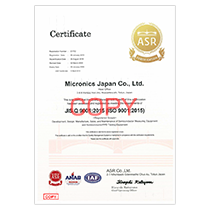 Customer Satisfaction - Technology - MICRONICS JAPAN CO.,LTD. MJC's products are developed, designed and manufactured under a quality management system (QMS) certified to ISO 9001. MJC maintains high-quality manufacturing and stable supply to improve customer satisfaction. To support the stable production of its customers, MJC has established a worldwide network of sites that provide after-sale support services. Customer engineers at each of these sites assist with a truly wide range of needs, from device or jig introduction, installation, and start-up work to instructing customers on how to use them and visiting customers to make on-site repairs if needed. Through close communication with customers and information sharing, customer engineers also provide proposals for better solutions that lead to productivity and efficiency improvement. MJC also guarantees that customers receive the same standard of quality services wherever they are in the world.